Who doesn’t like pizza? 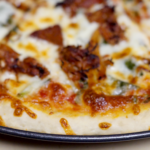 Pizza is a basic recipe every home chef should learn to master. The best homemade pizza starts with a good dough recipe. Easily customizable to include whatever toppings you prefer, pizza is a comfort food that the whole family will love. If you take a look at our family meal plan or follow along with my daily Instagram stories you will see that we have homemade pizza at least once a week. There are no complaints coming from the dinner table when it is homemade pizza night. The best homemade pizza starts with simple ingredients, most of which you probably already have on hand. Grab your favorite toppings and make some delicious pizza tonight. Attach the dough hook to your electric stand mixer, on low speed combine yeast, brown sugar, salt, olive oil, and warm water in the mixing bowl. Once thoroughly mixed, slowly add in flour on low to medium speed until a dough ball forms. Cover with a towel and sit in a warm place to allow the dough to rise. Depending on the warmth of your kitchen, the dough can take anywhere from an hour to 2 hours to rise until doubled in size. Once the dough has risen, punch down the dough. Then divide dough in half. This recipe will make 2 XLarge pizzas. If you have smaller pizza pans you will be able to make more pizzas depending on the thickness that you press out your crust dough. Grease two large/xlarge pizza pans with olive oil or coconut oil. With your hands, press out the half of the dough evenly onto each greased pizza pan. The size of the pan you will be baking your pizza on will determine how thick your crust is as well as how many pizzas this dough recipe will make. Once you have your dough spread and shaped to fit your pizza pan, top with your favorite pizza sauce, mozzarella cheese (or other cheeses you prefer) and toppings of your choice. Bake in the preheated 450°F oven for 5-10 minutes or until the crust and cheese begins to brown slightly. The more toppings you have on top of your pizza the longer it will need to cook in the oven before it begins to brown. Once the crust around the edges and cheese has begun brown slightly, remove from the oven and allow to cool for 5-10 mins before slicing with a pizza wheel. Don’t forget the sauce! Homemade pizza sauce is quick and inexpensive to make, check out this recipe on how to make your own pizza sauce. 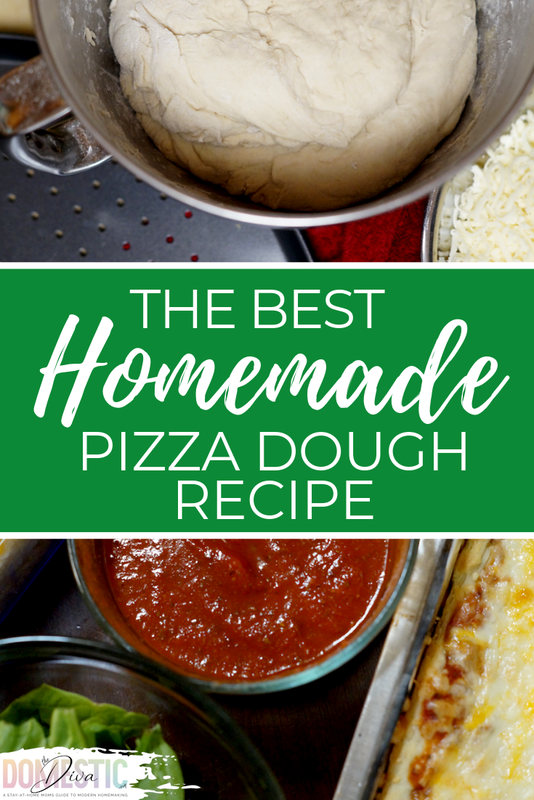 Homemade Pizza Dough plus Inexpensive Pizza Sauce and your favorite toppings equals an easy dinner to prepare no matter what day of the week it is. Homemade pizza night is so good you’ll forget about delivery. To complete your homemade pizza experience you need a good homemade pizza sauce recipe. Pizza sauce isn’t fancy or complicated. In fact, like any good recipe, homemade pizza sauce is simple and delicious. The wrong pizza sauce can easily ruin a pizza. When it comes to making pizza at home, besides having a great pizza dough recipe, you need a good pizza pan and pizza cutter. I prefer a nonstick, XL pizza pan with holes in it . The holes in the pizza pan allow for the air to circulate and crisp up the crust while you bake it in the oven. This insures that the crust will cook evenly and not be undercooked in the short cook time. Another pizza pan option would be a good cast iron pizza pan. Cast iron is always a good investment in the kitchen because it will literally last forever with proper care. When it comes to cutting your pizza there are all kinds of knives and gizmos. A simple Pizza Cutter Wheel is what I prefer because it gets the job done quickly and efficiently, rarely do I have to cut the same slice twice. If you are not into pizza wheels, another great option for cutting your pizza would be a long, stainless steel blade made specifically to cut your pizza through a rocking motion like the professionals use in top pizza kitchens. I love making pizza at home. You can control exactly what goes in it. I have never used brown sugar before though – usually honey. I’ll try it! Love, Love LOVE homemade pizza! I’ve never thought about putting brown sugar into the dough recipe! I look forward to making this. I always fail when making dough, for pizza or just bread. ha! I still want to try this recipe, we love pizza! My brother makes some amazing homemade pizza. I am going to have to use this dough recipe! Oh this is so handy for me – we just got a pizza oven and I wanted to try making our own pizzas. I am so going to give this a try this weekend! That’s a pretty easy dough recipe! I am loving the simplicity! I haven’t made some homemade pizza in a long time. I’ll have to add it to the dinner rotation. I have never made homemade pizza but am always so disappointed by delivery pizza doughs. I would love to be able to try this and see if I can do it. I have never tried to make my own pizza at home, but this recipe sounds easy enough! I will definitely give this a try, I think my family would love it! You know, in all my 61 years I have never made homemade pizza dough. The closest I have gotten is using one of those pizza kits. I am definitely going to give this a try. Yaaaaas I just made pizza last night but used store bought dough and was saying I need to start making it myself. This is perfect! I was thinking about finding a pizza dough recipe, and then yours popped up. I’ll be trying your recipe on our next pizza night. It looks great. Great recipe! I really like homemade pizza, it is my favorite treat lately. I do prefer the twisted cauliflower version lately but regular pizza dough gets better by the change. 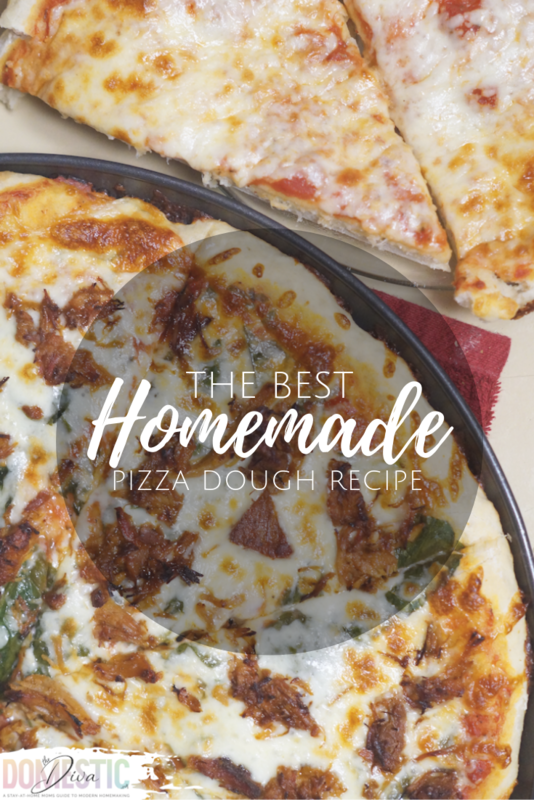 We love making homemade pizza and the dough is always a fun part. This recipe sounds delicious and it makes for a great pizza dough! I’ve never tried adding brown sugar to pizza dough recipe, I normally use regular sugar. I make it in batches at work. Does the brown sugar give it another flavor? Yes, the brown sugar would give it a bit of a different flavor. I love pizza. I could eat it almost every day! Lol. I’ve never made it from scratch and can’t wait to try this recipe! I’ve been wanting to try a pizza dough recipe for a long time now, so I decided to give yours a try. It came out perfectly and was so easy to make. I’m going to try it again and this time make pizzas with different toppings for my hubby and children. Yum!!! Tried this last night and it was a HIT with my girls. Homemade pizza is so much better than takeout (well unless you’re in NYC, whenever I’m there I have a pizza bucket list to eat my way through lol). I have never put sugar in my doughs – can’t wait to try this! The sugar is what feeds and activates the yeast. I sometimes make my own pizzas but never the dough – we always buy a base. Might try this out next time! This homemade recipe looks easy to follow. And I always believe that the best food is always prepared at home. Going to try this recipe.